PhoneView is a software for MAC that lets you store files on your iPhone or iPod touch along with a ton of other features. Phone View was previously called iPhone Drive. You can download a free demo from the ecamm website or buy the full version of the Mac Software for $19.95. – Backup and search your SMS Text and multimedia messages. 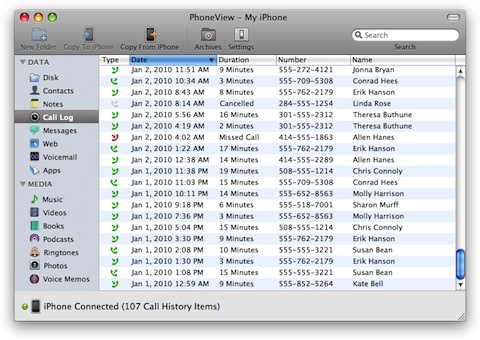 AppSafari review of PhoneView was written by Joe Seifi on July 18th, 2007 and categorized under Mac Apps, Utilities. Page viewed 5685 times, 2 so far today. Need help on using these apps? Please read the Help Page.